Two years ago in July my dad passed away. No, don't feel sorry for me or him - I believe he's in a better place. But I think about him in the fall because his birthday was October 29 - our only "fall" birthday in our family - until my daughter's Dec. 1 birthday which feels more like winter. Back when he passed away, I flew to FL to help my mom. 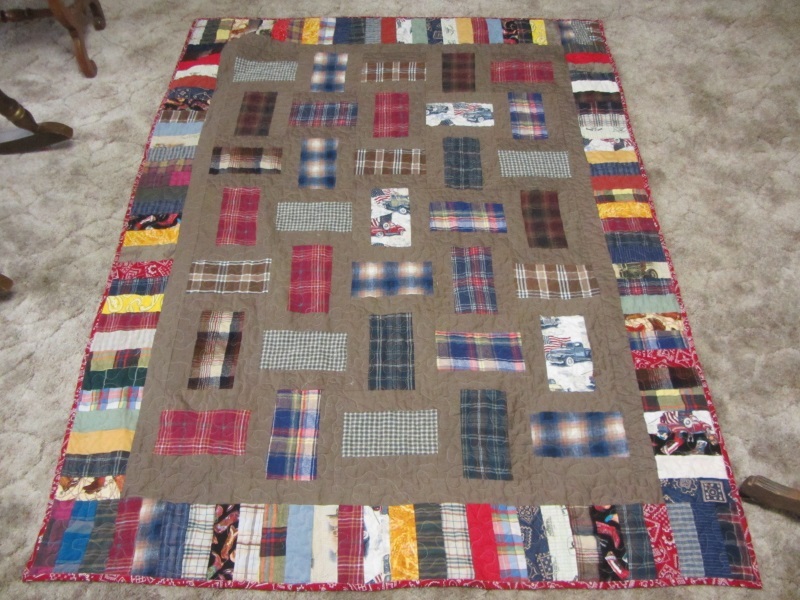 Mom went through his clothes right away and we donated his pants and outerwear to the thrift store, but I knew I wanted to make memory quilts, so after allowing the grandchildren to take his shirts if they wanted, I made 5 quilts for us kids and one for mom. I was in FL for a month and this was possible because I didn't have to do much else except to "be there" for mom. 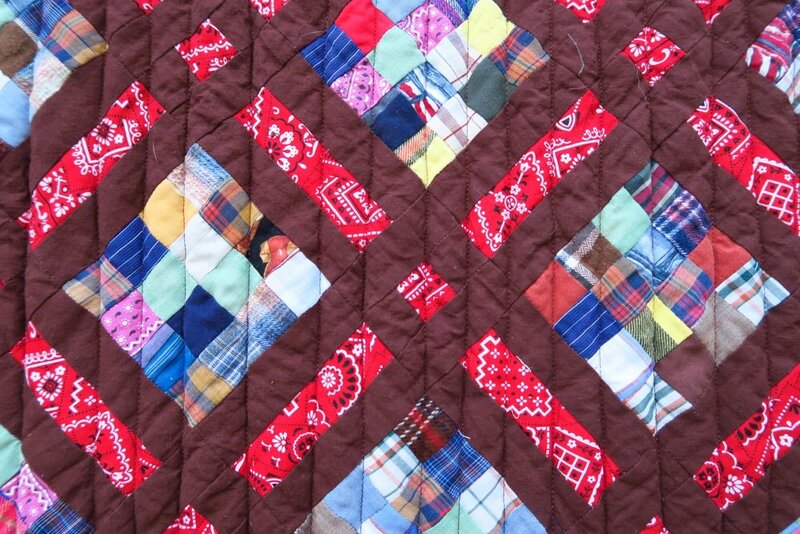 I made 5 simple rail fence quilts out of dad's shirts, supplemented with 3 identical brown sheets I found a thrift store - dad's favorite color was brown - and a few special fabrics I bought to add to it - cowboy boots, wheat fabric and bandanna. People that knew my dad knew he was a cowboy/wheat farmer, and preacher from Montana. I made mom's quilt different. We found the sheet in one of the closets in the area where dad had his study and he spent quite a bit of time. I only used 2 of dad's shirts for this quilt, though, and to be honest, I don't remember dad wearing these shirts. But I wanted to make mom flowers that she didn't actually have to take care of. When I quilted this one for mom, I quilted their life together in a sort of Cliff's Notes version around the outside. I tried to darken up the picture so you could see the words. Obviously I don't have the quilt with me at this time to retake a better picture - as it's in my mom's house in FL. 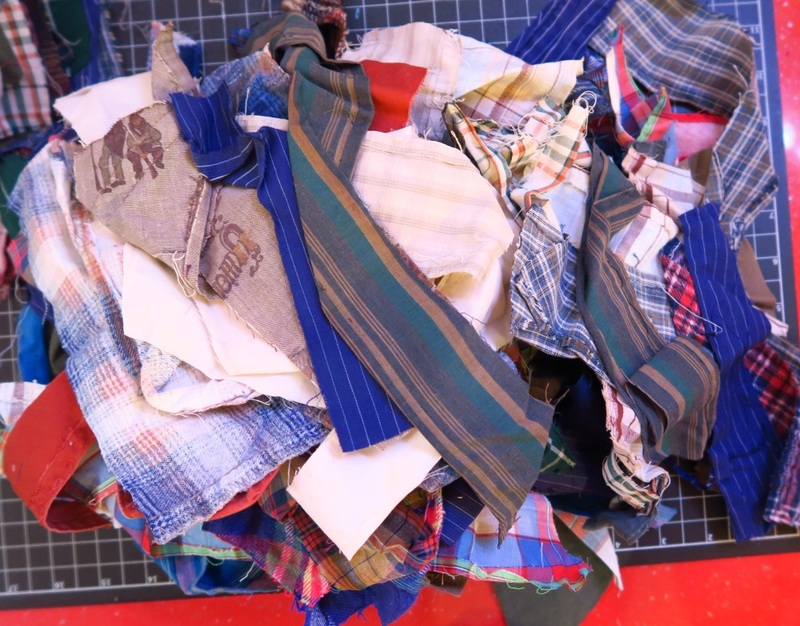 I then cut up all the leftover shirts that I hadn't used into 2.5" strips and brought them back to Poland in my suitcase to be made up later into more quilts for the grandkids. This is what I made up last year - my goal had been to be finished by his birthday - October 29. I made those 8 quilts. The first two on the left I kept for my husband and me since I had left my rail fence quilt with mom because it actually looked like dad more than the tulip one I had made her. The other 6 memory quilts have been gifted and are in their proper homes. However, recently, when I had to move part of my sewing room "stuff" due to the fact that my husband wanted to check for water in the corner of the room (there wasn't any), I found a zipper bag full of these pockets I had cut out into 8.5" squares when I cut up the shirts. I had forgotten about them! I had had this niggling feeling in the back of my head that I had forgotten something with regards to dad's shirts, but didn't really focus on it since I've not run out of things to do. There are 50 pockets in this bag! Then I also found a zipper bag of some more 2.5" squares. They totally surprised me since I thought I used up the last few of those with the last couple of quilts shown above. Then, I found a few more scraps. I had wanted to make some Christmas ornaments for the grandkids out of the scraps, but wasn't sure I could since I had previously only had crumbs left. 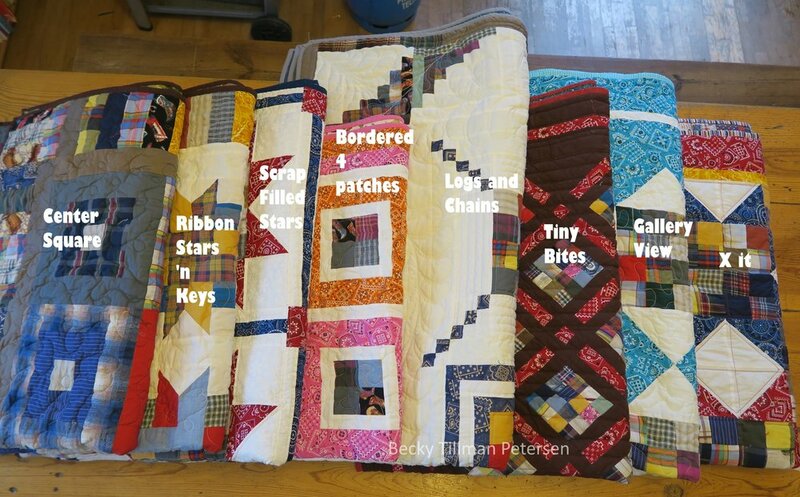 Let me show you - I had made the quilt I called "Tiny Bites" out of the rest of the pieces I thought I had - using 1.5" strips. I literally thought I had only pieces left that were less than 1.5" x 1.5", so making ornaments was going to be pretty tedious! I was delighted to find these scraps! Normally I only share with you what I've done - and not what I'm hoping to do. But this is sort of both - partly because I found these goodies in my recent organizational/cleanup of my sewing room, but also because it's also a review of the quilts I've made out of upcycled shirts. If you need something to help you with your own projects, be sure to check out what my sister has for you over in the shop area of this website!